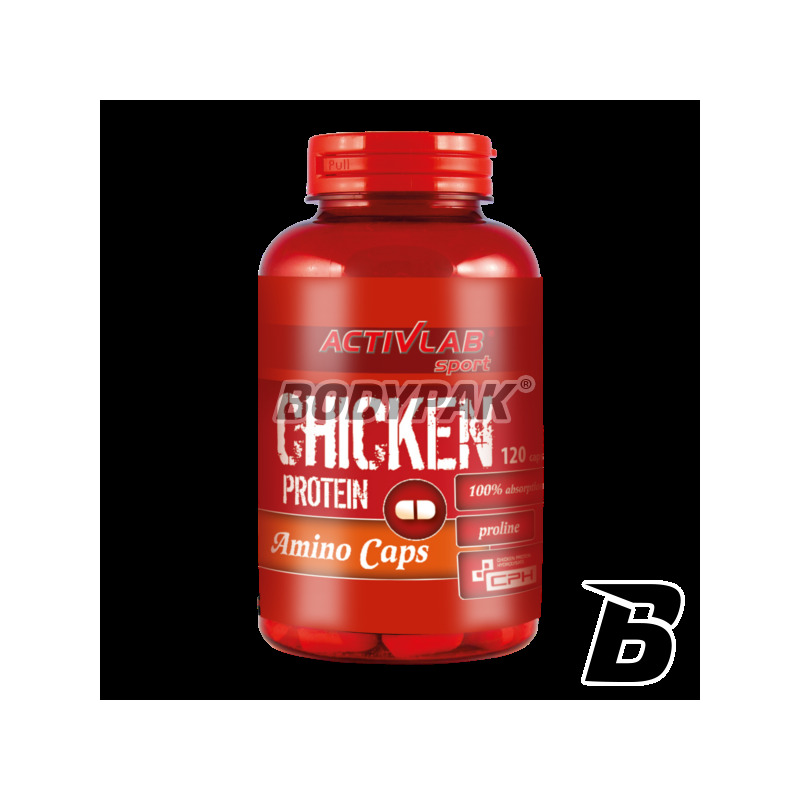 Amino AcidsActivlab Chicken Protein Amino Caps - 120 kaps. Concentrated source of branched chain amino acids. Branched chain amino acids build approx. 1/3 of skeletal muscle mass, they have anticatabolic effect, and play an important role in muscle protein synthesis. Highest quality! 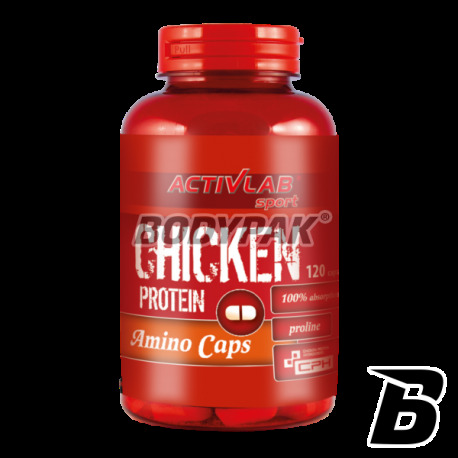 Activlab Chicken Protein Amino Caps - 120 kaps. Innovative product of ACTIVLAB CHICKEN PROTEIN AMINO CAPS contains hydrolysed poultry protein which is a great source of amino acids that build muscle and L-proline, an amino acid that is important in the production of collagen. The highest quality source of protein ensures better growth and faster regeneration after training! This product supplies building material particularly rich in arginine, glutamine and glycine, so it can help to improve muscle blood flow, increasing the concentration of creatine in muscle. 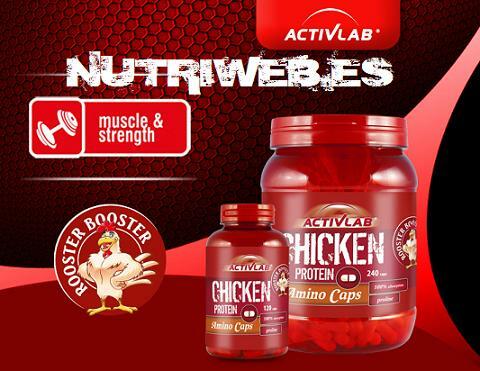 Using ACTIVLAB CHICKEN PROTEIN AMINO CAPS hydrolysed protein poultry helping not only your muscles but also the joints. High proline content will allow you to more production of collagen, which is the protein found in connective tissue, and tissue to ligaments, tendons, articular surfaces. Collagen is also responsible for elasticity and firmness. The preparation of the amino acid hydrolyzate of poultry protein ACTIVLAB CHICKEN PROTEIN AMINO CAPS can use all physically active regardless of gender. Poultry protein hydrolyzate (HBD) is formed as a result of hydrolytic treatment of breast meat chicken. HBD a source of protein having the fastest bioavailability, and has an ideal amino acid composition. Products based on HBD are recommended especially for building muscle mass, because the high content of amino acids such as arginine, glutamine and glycine may have the effect of increasing the secretion of NO during training and raising the level of creatine in the body. HBD also contains proline. This amino acid is the main component of collagen, the basic component of connective tissue. ACTIVLAB CHICKEN PROTEIN AMINO CAPS - INNOVATION IN THE FIELD OF SUPPLEMENTATION! Składniki: Hydrolizat białka drobiowego, substancja przeciwzbrylająca E 470b, otoczka (żelatyna, barwnik E171). Fajne uzupełnienie posiłku kiedy nie mam pełnowartościowego białka w moim pojemniku! Drobiowe aminki? Dlaczego nie - w końcu to pełnowartościowe białko. Cenowo wychodzi dobrze, kapsy nie są trudne do połknięcia. Trec Taurine 900 - 120 kaps. Crystal clear taurine in convenient tablets! Improves concentration, increases the strength of exercise the body - bet on proven materials! Activlab BCAA 1000 XXL - 120 tabl. Branched-chain amino acids: L-Leucine, L-isoleucine, L-valine balanced in perfect proportions.! They support regeneration and protect against catabolism!